You are currently browsing articles tagged St Fagans. MERL 86/147/2. 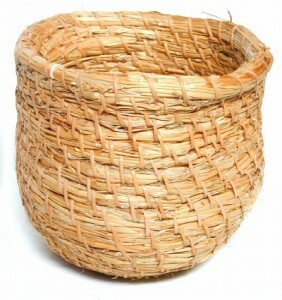 A lipwork basket made by Alec Coker and Doris Johnson – two craftspeople who were experts in straw work. We have a few lipwork baskets that might be examined during the Stakeholders study visit. However, these baskets are nothing compared to the impressive lipwork chairs I saw at St Fagans. Apologies for the absence of a Stakeholders post last week. We’ve all been kept very busy with the Our Country Lives project (for the redevelopment of MERL) – although I did escape on Tuesday to visit St Fagans National History Museum in Cardiff, where I was lucky enough to have a guided tour around the basketry collection (lots of amazing lipwork chairs, beautiful cyntells, and some thought-provoking lobster pots). I do, however, have some good Stakeholders news – all of the participants have now been confirmed! So today I’d like to introduce you to five of them. Bunty Ball is Vice-President and Past Chairman of the Basketmakers’ Association, and was given a lifetime achievement award this year by the Worshipful Company of Basketmakers in recognition of her contribution to and support for basketmaking – as an art, a craft and a trade. She specialises in and teaches chair-seating – in cane, rush, willow and skein willow. Hilary Burns originally trained as a fabric weaver, before taking up basketmaking in the 1980s. She works mainly with willow and hedgerow materials, producing both functional and sculptural pieces inspired by her study of traditional basketry techniques. Hilary is a co-founder of Basketry and Beyond, a voluntary organisation in the South West which promotes the use of natural materials and sustainable construction, and visited MERL as part of the organisation’s preparation for their Festival in May this year. She also teaches basketry to adults and children. Mary Butcher is President of the Basketmakers’ Association. She was awarded an MBE last year for her services to basketmaking, and became a ‘Crafts Skills Champion’ at the Craft Skills Awards in May this year. Mary started out as a willow specialist, learning local traditional work from apprenticed makers, but now makes traditional and contemporary work in a wide range of materials, and using a wide range of techniques. She is committed to the transmission of basketry knowledge – researching the history of basketry, writing on the craft from both a historical and practical perspective, and teaching and mentoring. Mary has also curated and exhibited in innumerable exhibitions (solo and collaborative) and installations. Sue Kirk describes herself as an ecological basketmaker. She works in willow, using a mixture of organically home-grown willow (she grows over fifteen varieties) and Somerset willow, making traditional and contemporary baskets and sculptures. Sue also teaches and runs workshops for beginners and improvers. John Page began his basketmaking career with a City & Guilds course in creative basketry at the City Lit, having been greatly impressed by the Crafts Council’s Contemporary International Basketry exhibition. He now teaches rushwork at the City Lit and coordinates the course, and brings his students to MERL to view the basketry collections. He also edits the Basketmakers’ Association newsletter, and repairs harps. I’m off to the Basketmakers’ Association AGM at the Artworkers’ Guild in London tomorrow, so hope to see some of you there! If you’re in Reading tomorrow, don’t forget to come along to Apple Day at MERL, 13.00-17.00.